Alastair Seeley on the Gearlink Kawasaki at last year's North West 200. Practice for the Vauxhall International North West 200 blasts off on Tuesday, providing an early insight into who is likely to be at the sharp end heading into Thursday evening’s opening races. All-time record holder Alastair Seeley is a major contender on the Tyco BMW and Gearlink Kawasaki machines. The Carrick man won both Supersport races on the Gearlink ZX-6R last year to move onto 17 victories, surpassing the previous benchmark of 15 wins held by the late Robert Dunlop. Seeley must line up as the favourite for more glory in the 600cc class, but he has had limited track time on the BMW S1000RR machines compared to most of his chief rivals. 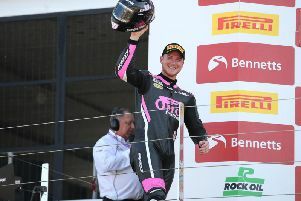 The 38-year-old was called in as a replacement for Davide Giugliano for the Bank Holiday MCE British Superbike meeting at Oulton Park, gaining some time on the Superbike prior to the North West. He also tested last week at Kirkistown in Co Down. It could be the case that Seeley will be on the back foot a little in the Superbike and Superstock classes, but he does have plenty of prior experience on the S1000RR and won the Superbike race for the TAS Racing team at the North West in 2015. He remains as fired up as ever and has set new targets for the north coast meeting, requiring one more podium to equal Phillip McCallen’s record of 28 top-three finishes and outlining his goal of taking his win tally past 20 victories. “Hopefully we’ll get some good weather like we did last year but it’s not getting any easier, with the calibre of riders coming from BSB and the road racers upping their game too,” Seeley said. “We’re not getting any younger either and the years are ticking on, but I look to the likes of [John] McGuinness and [Michael] Rutter and they can still be running at the front of the classes and they’re on good machinery. Seeley’s opposition is fiercer than ever, with last year’s Superbike winner and outright lap record holder Michael Dunlop riding his new Bennetts Suzuki, while William Dunlop is another former winner in the Supersport and Superbike classes. Ian Hutchinson is also at the top of the shortlist on the Tyco BMW and McAMS Yamaha machines, with Peter Hickman also expected to shine on his return to BMW machinery in the Smiths Racing team. Another BSB frontrunner – Glenn Irwin – is the name on everyone’s lips on the PBM Ducati as he makes his big bike debut at the event. The old guard is ably represented by 13-time NW200 winner Michael Rutter, Flying Kiwi Bruce Anstey and John McGuinness, who is joined in the official Honda Racing team by Guy Martin. And Lee Johnston is another standout name on the Jackson Racing machines. The Fermanagh man is back to full fitness and won the Superstock race in 2015 at the North West.